Rick Rush print, "The Crimson Rose"
Pre-bids will be accepted via e-mail starting at Noon on Monday, November 28 and ending at Noon on Monday, December 5. To submit a pre-bid, send an e-mail to auction@uanyc.com with UANYC Silent Auction in the subject line. - The item(s) you would like to submit bid(s). - The minimum and maximum bid prices for each item. The minimum price must be higher than the reserve price listed. - A contact phone number where you can be reached following the event. For those submitting pre-bids: If your maximum pre-bid turns out to be the highest bid on that item after the event, you will be charged the highest price of the in-person bids plus $10. Example: For an item with a reserve price of $200, you submit pre-bid minimum of $250 and maximum of $500. The highest price of the in-person bids ends at $300. This means you would win the item at a cost of $310. Cash, check and/or credit card will be the acceptable forms of payment for bid items. Checks should be made payable to the Greater New York Alumni Association. 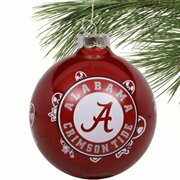 A great Christmas present for the ultimate Crimson Tide fan: a Nike football signed by head coach Nick Saban. This 22x33 limited edition, hand-done original serigraph was silk-screen printed in the Rick Rush Studio in Tuscaloosa, Ala. This edition consists of only 200 numbered prints and 20 Artist Proofs. Each print is signed and numbered by Rick Rush and comes with a certificate of authenticity and vellum sheet telling the story of The Crimson Rose. Two tickets to a 2012 Alabama home football game (Ole Miss, Missisissippi State or a non-SEC game) with two tickets and a VIP parking pass to the GameDay 2012 hospitality event that begins four hours before kickoff at the 1410 University Blvd. lot. Courtesy of Alabama grad Joshua Koch, a signed autographed football from the 2011 New York Jets.